China will improve its forestry policies and forest insurance system to reduce the financial burden of forestry development, said Chinese Vice-Premier Hui Liangyu on Wednesday. 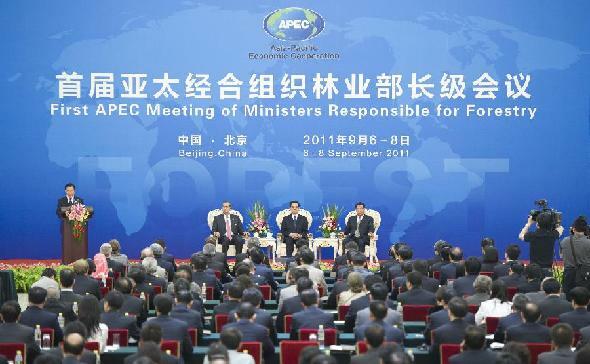 "We will increase our investment in infrastructure development related to drinking water, electricity, roads and communications in the forest areas," Hui said at the closing ceremony of the first APEC Meeting of Ministers Responsible for Forestry, which was held in Beijing. He also said the country will invest in forest seeds and seedlings, forestation, forest tending and the reconstruction of dangerous buildings to improve the livelihood of forest-dependent residents. "China has invested hundreds of billions of yuan to launch and implement key forestry programs," said Jia Zhibang, director of the State Forestry Administration. China now has 62 million hectares of man-made forest, the most in the world. Its forest coverage is 196 million hectares. "In 2007, the Chinese government made it clear that by 2020 it will become a country with a good ecological environment," Jia said. To achieve this goal, Jia said that China will allow social investment in forestry, strengthen protection of forest resources and cooperate with other APEC economies. On Wednesday, APEC members approved the Beijing Statement on Forests and Forestry, enhancing Asia-Pacific cooperation to address challenges facing forestry development. The statement highlights the necessity to deepen economic and technical cooperation in forestry among APEC economies, and attaches importance to forests and forestry legislation and policies. "To promote forestry development of the region, the political will of the APEC economies to address forestry problems should first be elevated," said Zhang Zhongtian, director of the multilateral division under the State Forestry Administration. He also said that China should be able to help more developing countries with their forestry. Elvira Quesada, Mexico's environment minister, was impressed by China's achievements, and looks forward to further cooperation. "It's a great chance to continue supporting, as a region, the global efforts to fulfill the Cancun Agreements on Climate Change so we can be able to reduce emissions from deforestation and forest degradation."